Thought of doing something refreshing, I just came into my kitchen. Got an idea of doing fruity yoghurt since I had many fruits in the fridge. Its pretty light dessert because I used low fat yoghurt. As we know 2 servings of vegetables and fruits has to be taken each day this satisfies atleast fruit part and this is so fun, delicious and also make kids involve in arranging. 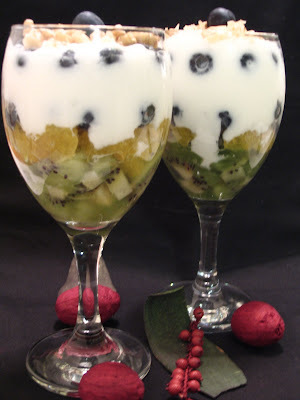 Here I used three fruits kiwi, blueberry and oranges. But there is no hard and fast rule in using the fruit combinations. So simple, easy to do and it is also delightful to end any meal. Give them a go!!!! 1. Chop all the fruits. 2. Whisk honey with yoghurt and keep it aside. Garnish nuts at the time of serving, so that we can feel the crunchiness of nuts. Oh my god!! This is awesome! Looks yummy!! Will definitely try it out. it looks very nice surely it tastes yummy!!! Im already thirsty looking at this!!! You are really talented. Is there a reason behind naming "FRUITY YOGHURT"? I believe it should be YOGURT. Anyways dish looks attractive..
Anand no secret reasons for naming this yoghurt. As this is combination of fruits and vanilla yoghurt i named it like this. And Yoghurt, yogurt, yoghourt, youghurt or yogourt are several variations of the spelling of the word in different countries. And thanks for your appreciation. I love yoghurt! so i am sure i will like this. will try it out soon.